Turkish protesters gather in Taksim Square during a May Day rally in central Istanbul on May 1. 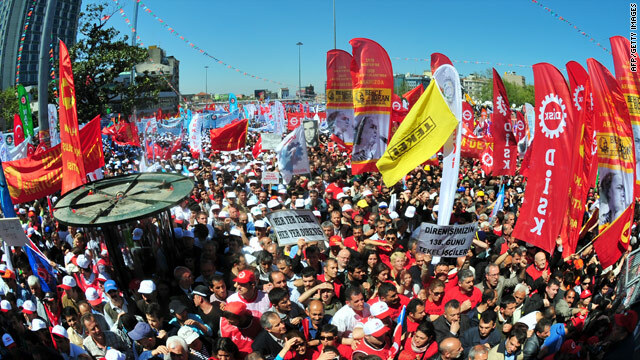 Istanbul, Turkey (CNN) -- Tens of thousands of union members and leftist political activists gathered Saturday for the first legally-sanctioned May Day celebration in Istanbul's central Taksim Square in 30 years. Participants included relatives of at least 34 people killed when clashes erupted in Taksim between leftists and police on May Day in 1977. May Day rallies have been banned in Taksim Square since army generals swept into power in a military coup in 1980. For the past four years, union activists determined to commemorate the May Day massacre have clashed with riot police who barred their entry to Istanbul's busiest central square. On such occasions, tear gas hung in the air and police were seen clubbing activists. The governor of Istanbul said he authorized the celebration this year "to avoid tension ... and even to destroy certain taboos." "This May Day, which I believe will be peacefully celebrated, will be a reference point for subsequent years and will also mark a new beginning," Gov. Muammer Guler told Turkey's semiofficial Anatolian Agency. Union organizers are calling Saturday's rally a victory for Turkish labor. "It has very symbolic meaning for us," said Eyup Ozer, a spokesman for the Revolutionary Workers Unions Confederation, known in Turkey by the acronym DISK. "All the people who were murdered in the 1977 May Day demonstration will be represented by their photos." Thousands of flag-waving union members filed peacefully Saturday past a labyrinth of security barriers, armored personnel carriers and helmeted riot police often referred to in Turkey as "Robo-cops." Against a soundtrack of blaring labor anthems, activists chanted slogans like "Equal Jobs, equal Pay," "Free Health Care for Everyone" and "Long Live May 1st." According to the Istanbul governor's website, 22,361 police are providing security. About 3,500 reinforcement riot police were brought in from other cities. "In order to prevent the repetition of some sad events in the past," the website announced, "the riot police were trained in communication techniques, stress management, anger management and control."